Philadelphia, PA – December 7, 2016 – The Independence Blue Cross Foundation (Foundation) announced grants totaling nearly $3.1 million through its Blue Safety Net, Building Healthier Communities, and Healthy Hearts programs. The grants are aimed at supporting healthier lifestyles and strengthening the delivery of health care. Through the Blue Safety Net program, the Foundation funds private, nonprofit community health centers that provide affordable access to quality care in medically underserved areas. In its latest round of funding, the Foundation awarded more than $2.8 million in grant funding to 40 health centers that serve nearly 200,000 individuals. The grant awards include $450,000 in targeted funding to build health center capacity, including support for several important projects addressing dental and behavioral health care integration in primary care settings. Other supported projects focus on advancing trauma-informed care models in community health centers. Associated Services for the Blind and Visually Impaired to provide Personal Adjustment to Blindness Training, including orientation and mobility training, activities of daily living, and communication skills. Central Bucks YMCA for a Veterans Wellness Initiative to introduce veterans to alternative forms of preventative wellness with a mind/body focus, including yoga, tai chi, and aquatic exercise. Cradles to Crayons support for the Everyday Essentials program which works with more than 275 human service agencies to provide children to age 12 the essential items they need to thrive – at home, at school, and at play. Family Support Line to address the trauma of child sexual abuse through an array of sexual abuse prevention education programs for children. 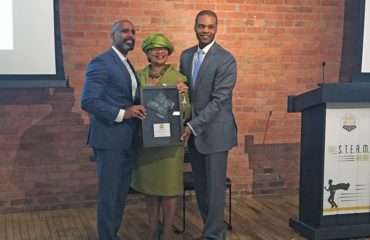 Greater Philadelphia Urban Affairs Coalition in support of Coalition U, a training program that offers seminars and workshops focused on improving overall organizational growth and development. Hedwig House for the PREP and HOPE Academy to assist individuals with chronic and serious mental health issues to live independently. Menzfit for the Career Development program that empowers disadvantaged men to realize their full potential and equips them with the tools to secure and maintain employment. Philadelphia City Rowing for a wellness program for Philadelphia public high school students to access rowing as a competitive sport and empower them with tools for academic success and a healthy lifestyle. Street Soccer USA for access to Street Soccer USA curriculum which connects soccer skills with a series of essential life skills for youth in North Philadelphia. Transformation Yoga Project to address the epidemic of trauma in our community, which is exacerbated in jails, with free trauma-sensitive yoga for men and women in three county jails. William Way LGBT Community Center to deliver and improve health services responsive to the needs of LGBT individuals in Philadelphia and surrounding counties. CPR Ready Campaign which aims to significantly increase the number of qualified and willing people to perform bystander hands-only CPR, as well as use AEDs in our region. Simon’s Fund which provides free heart screenings to children, advocates for life-saving legislation, hosts awareness events, and promotes research. The Mobile CPR Project which aims to increase survival rates of sudden cardiac arrest through a mobilized CPR training model at no cost to community participants. Securing the Blue Safety Net: Achieving sustainability of the regional safety net by building capacity in health centers. Bolstering the Health Care Workforce: Advancing the education and professional development of nurses and nurse leaders. Addressing Health Priorities: Addressing national health trends locally through community-driven research. Building Healthier Communities: Driving wellness by targeting specific and diverse community health needs.